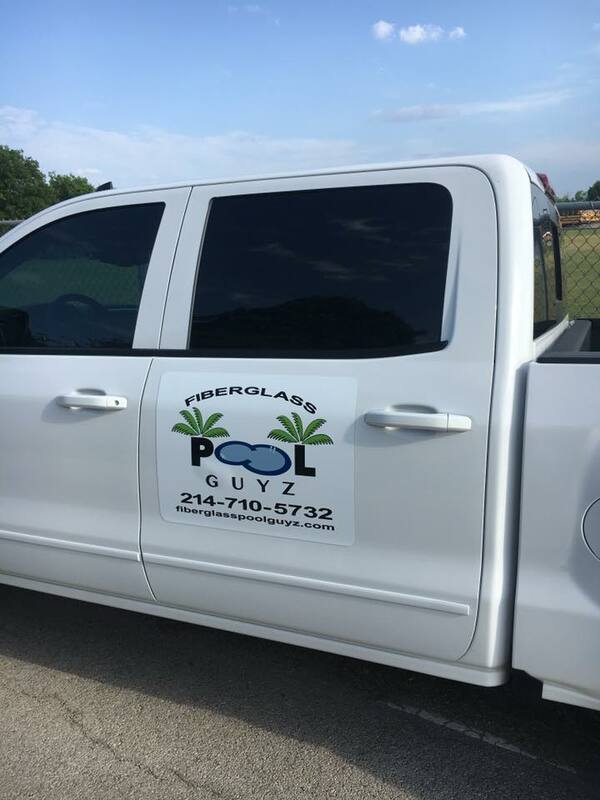 We are hard at it this week with the completion of another fiberglass swimming pool in University Park TX. 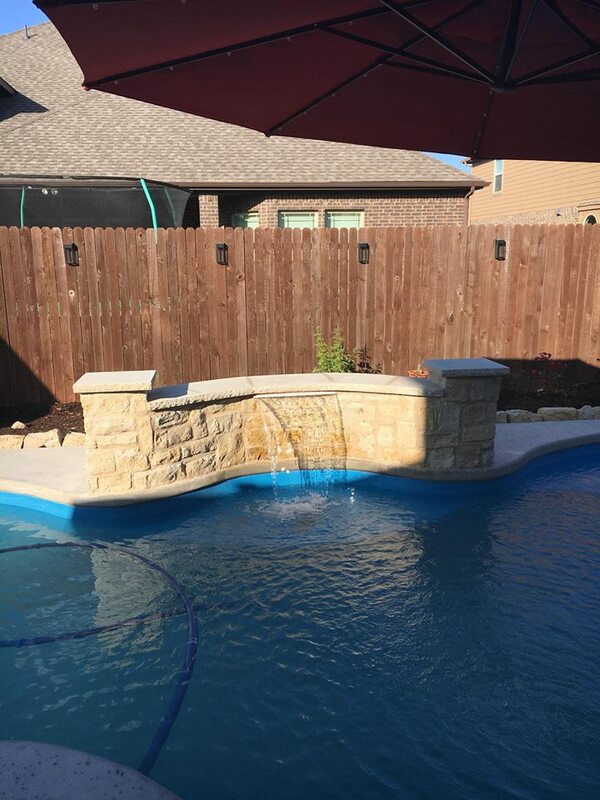 We are finishing up at that job site presently, so we are taking a moment to cover a job recently completed: Fort Worth TX! 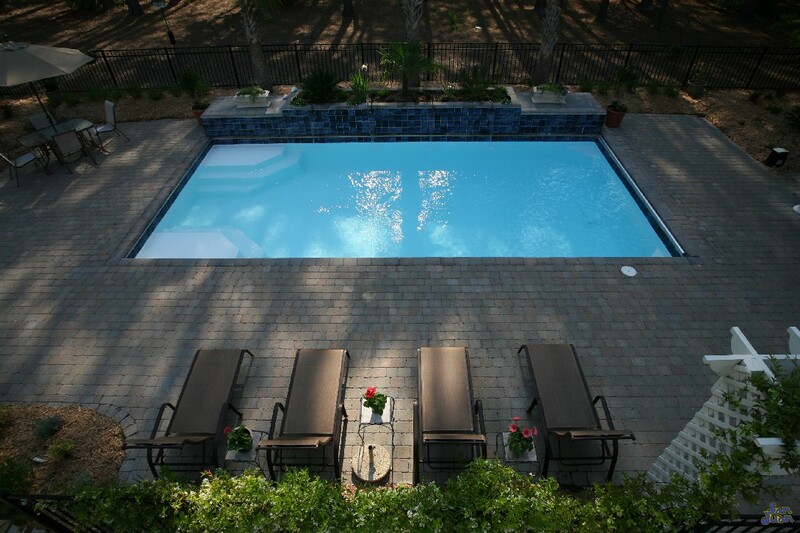 We are hard at it this week completing our installation of a Sundial pool model in University Park, TX. 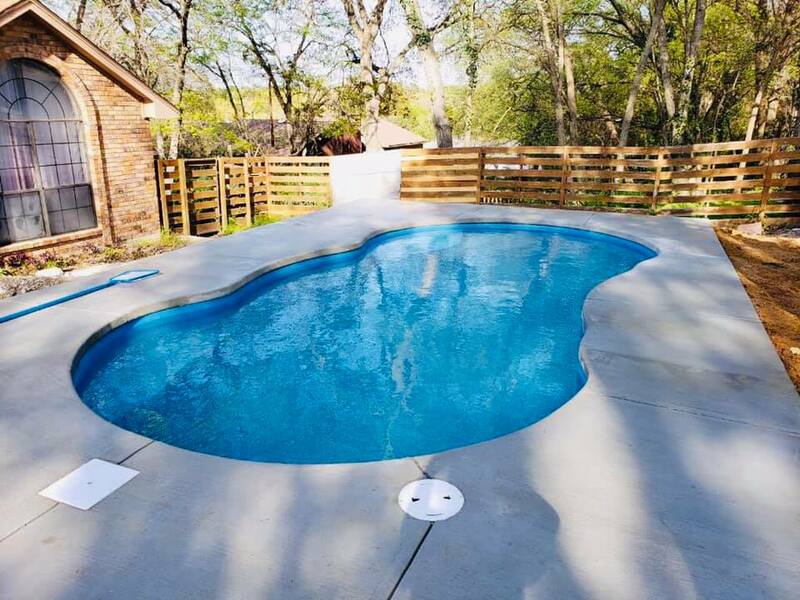 We installed and set this swimming pool last week but are completing our cleanup and pouring our concrete deck this week. 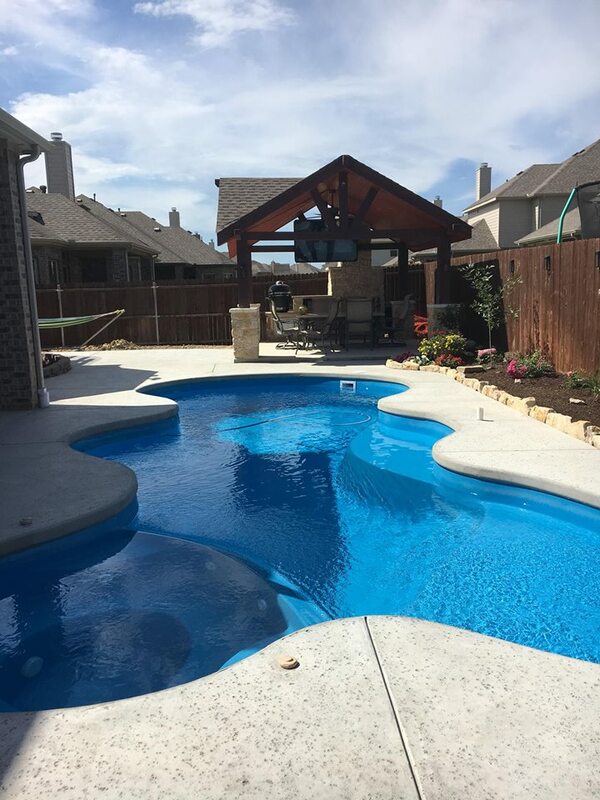 This allows us to take a brief moment to recap our recent installation of a Desert Springs fiberglass shell in Fort Worth TX! 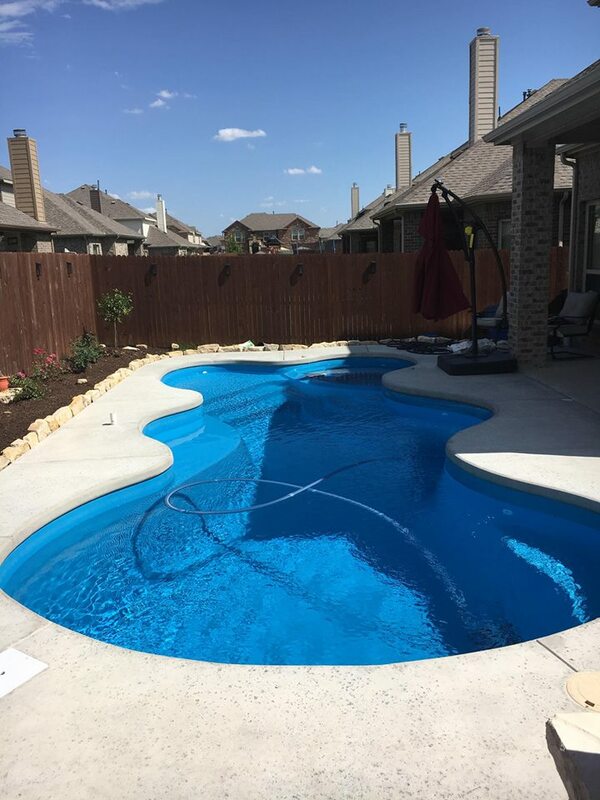 The above image shows a gorgeous Desert Springs fiberglass pool installed in June of 2018 in Fort Worth TX. 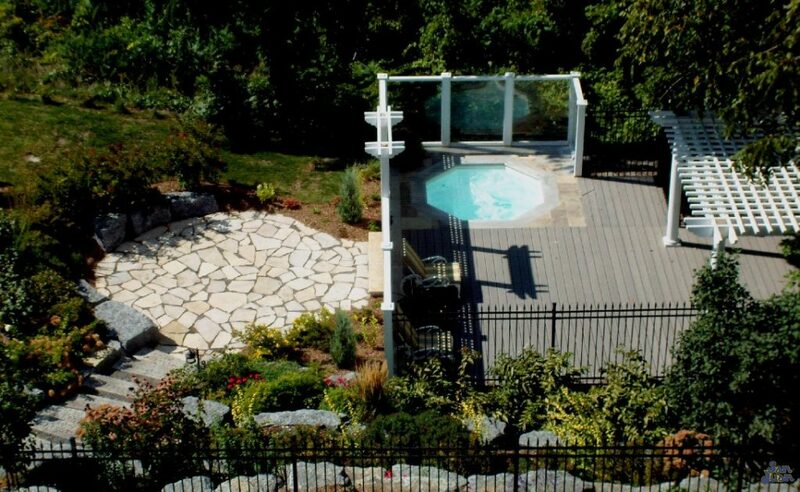 We love the beautiful blue lagoon gel coat paired with the ivory cantilever deck. Our crews had to dig through some pretty intense layers of bedrock during our excavation phase of this project. We had to add on two days of work to remove these foreign objects and create space for our gorgeous Desert Springs pool model. 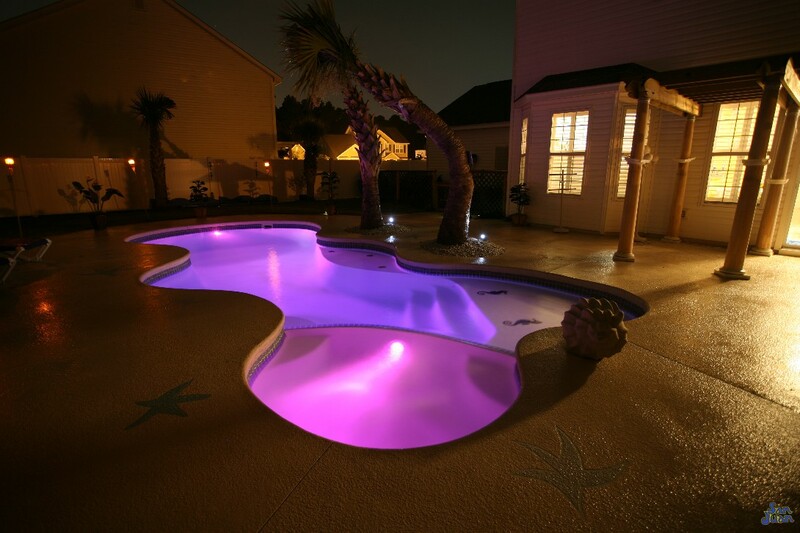 This beautiful swimming pool provides a very interesting free-form design that mimics a “lagoon” style layout. 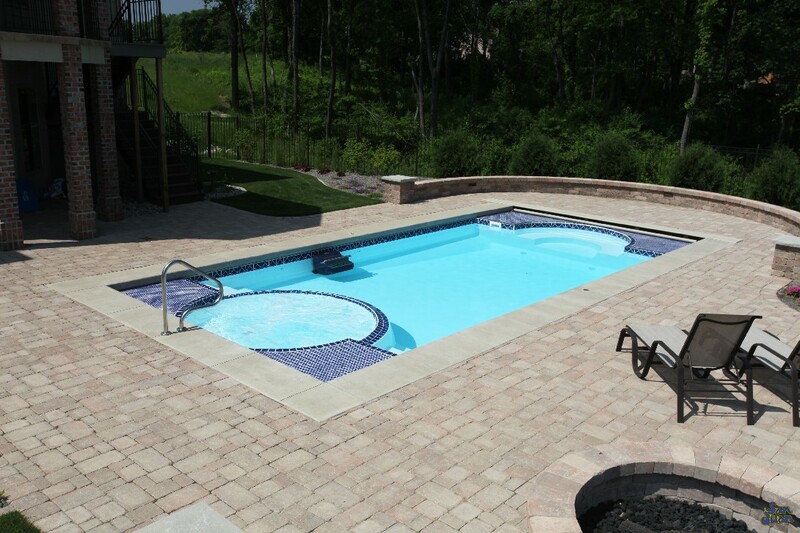 The various curves, multiple step entries, deep end and compact body make this pool perfect for entertaining and families with children. 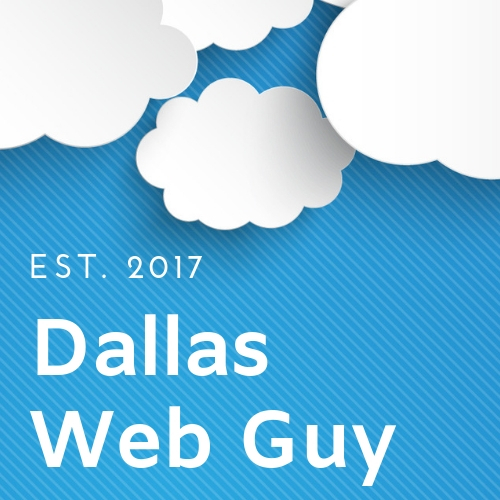 We loved working on this job. It presented some fun and interesting challenges due to it’s compact yard, bedrock and multiple construction aspects. 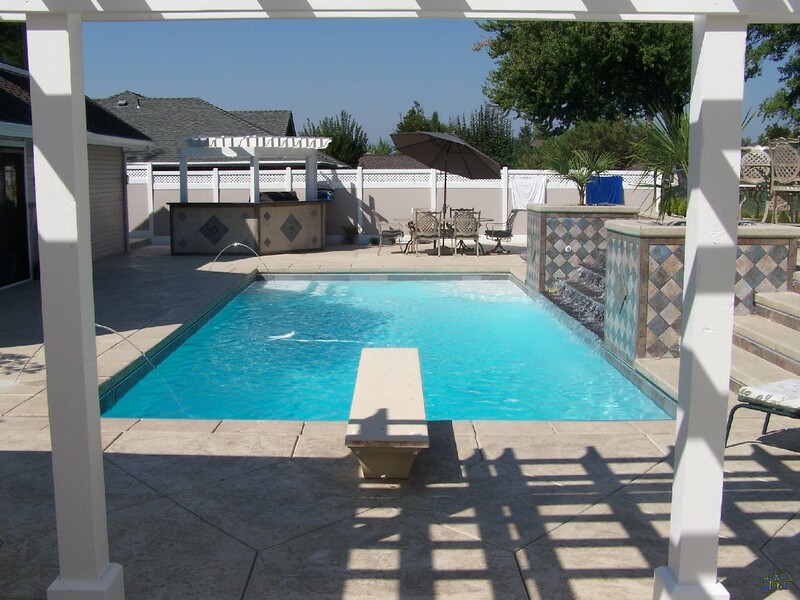 Throughout our entire project we installed the fiberglass swimming pool, concrete deck, raised waterfall and outdoor kitchen! 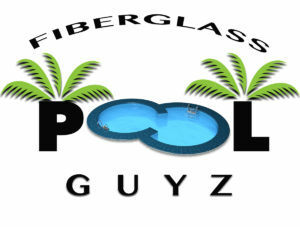 With Fiberglass Pool Guyz, our objective is to create unique backyard living spaces that bring your home life outdoors. 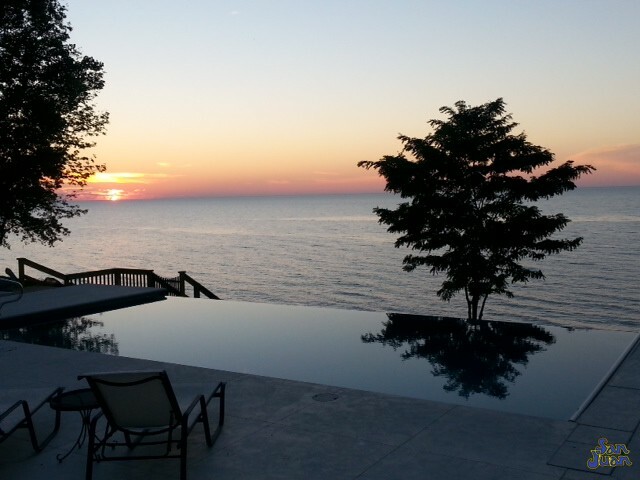 The trick to the trade is dreaming up what exactly you’d like to create for your outdoor living space. 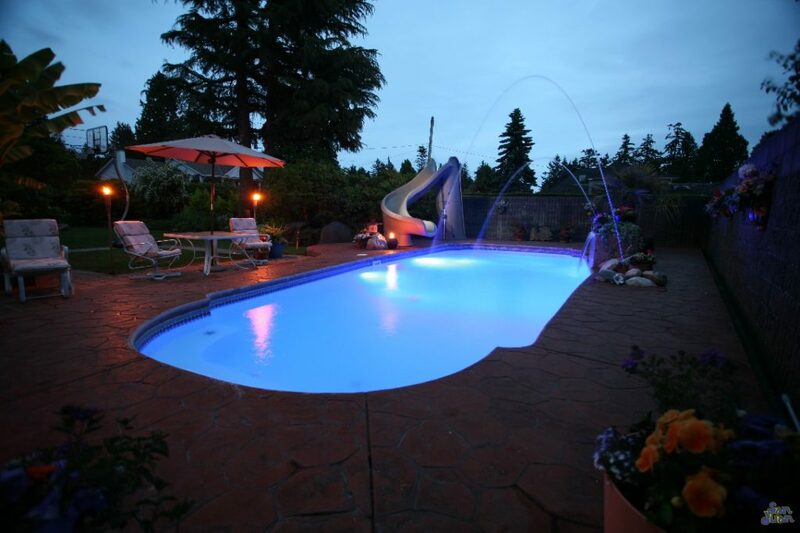 When most home owners contact us, they are dreaming of a swimming pool to dive into and cool off… that’s the easy part. 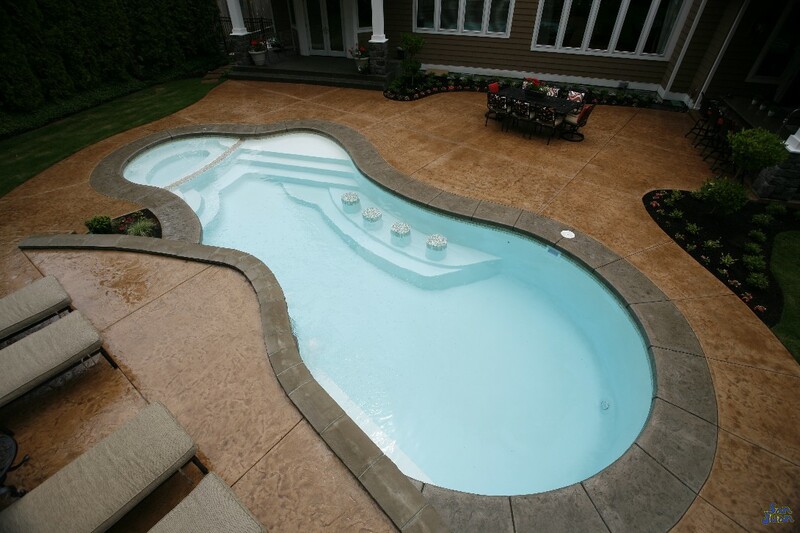 The tricky part is what else would you like to put into your new backyard? 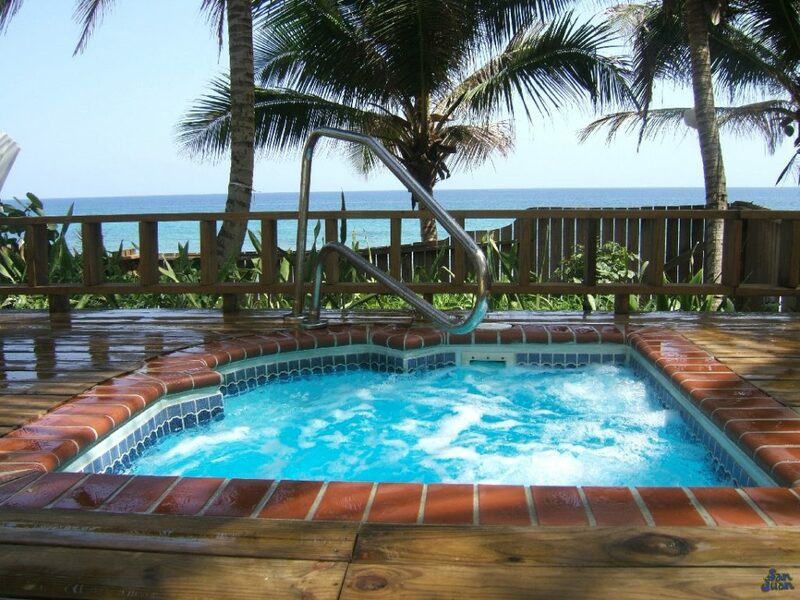 We have lots of options that provide amazing relaxation spaces for you and the entire family. Maybe dad wants an outdoor kitchen to grill some steaks. 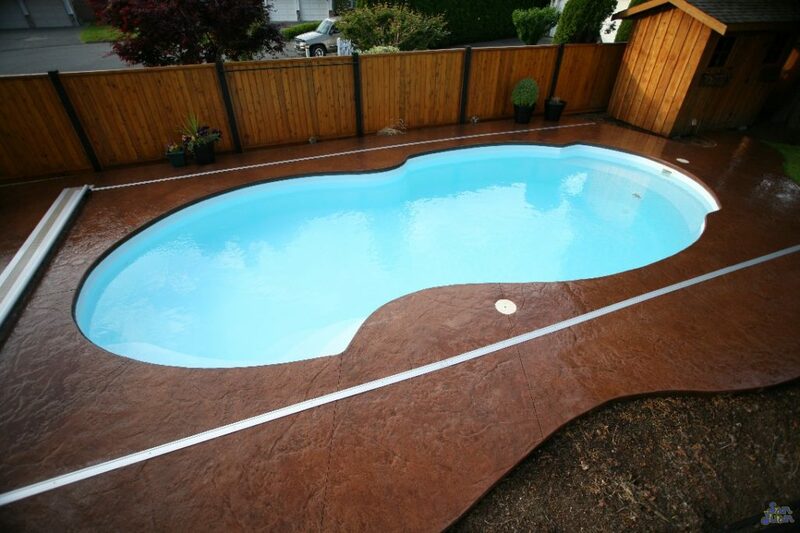 The kids of course want the amazing fiberglass swimming pool. 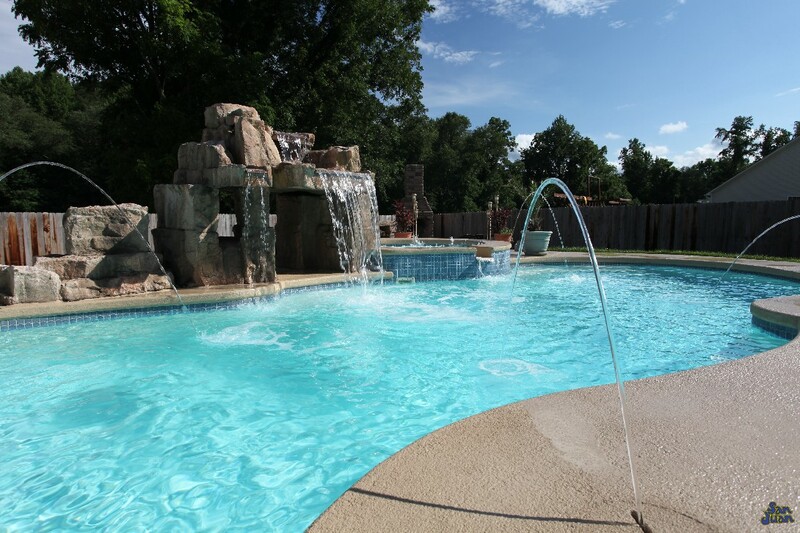 Mom may want a sun deck or splash pad to catch some rays and work on that summer tan. 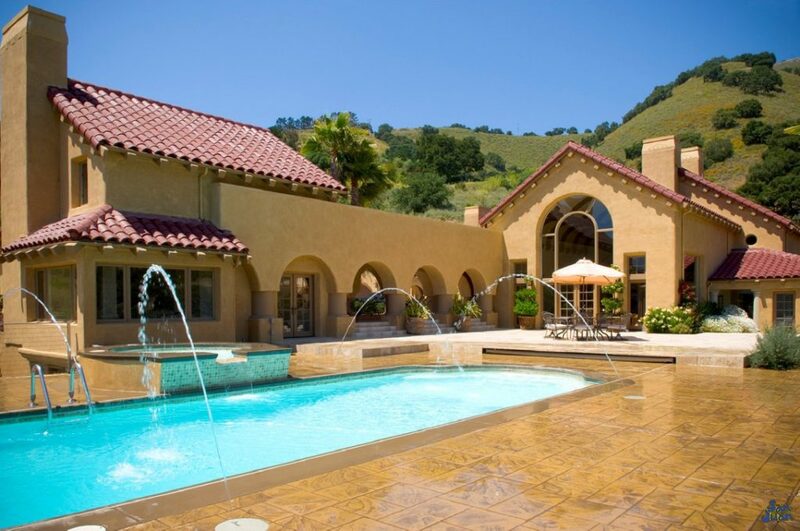 Our objective is to discover all of these hidden family dreams during our sales process. We love customers who are candid and provide all of these details up front. 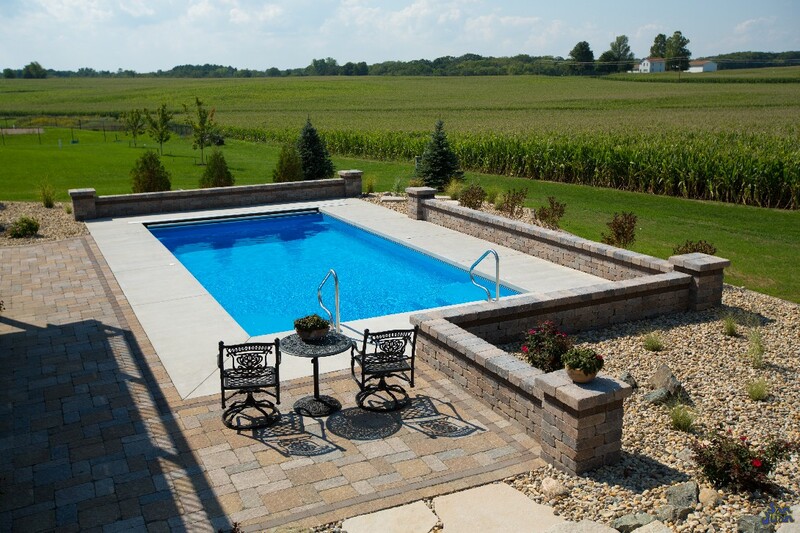 The more we know about your dream backyard, the better! 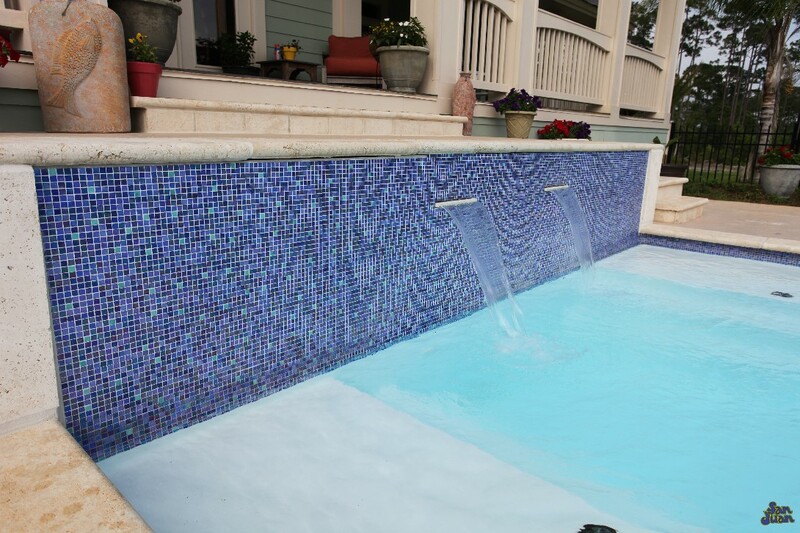 This is a great image of our raised water feature that we added during the final stage of our installation process. 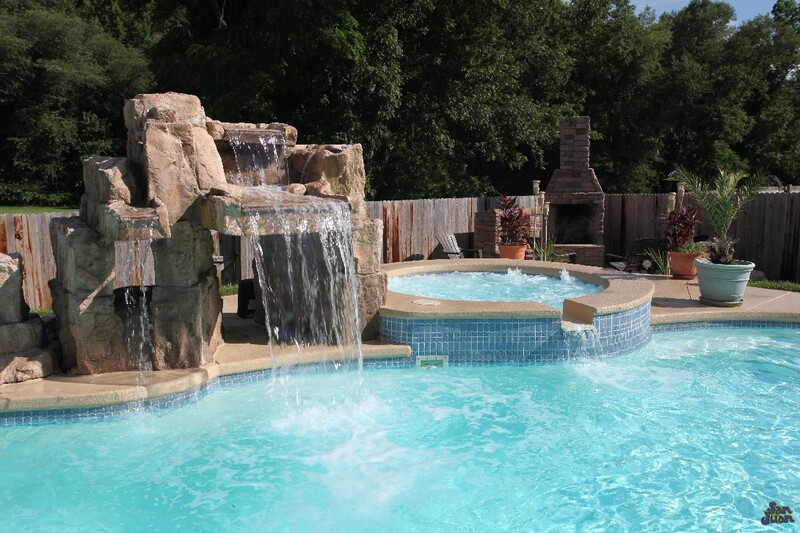 Waterfalls are great add-on features to your backyard! We offer multiple sizes to create a unique look that is perfect for you! 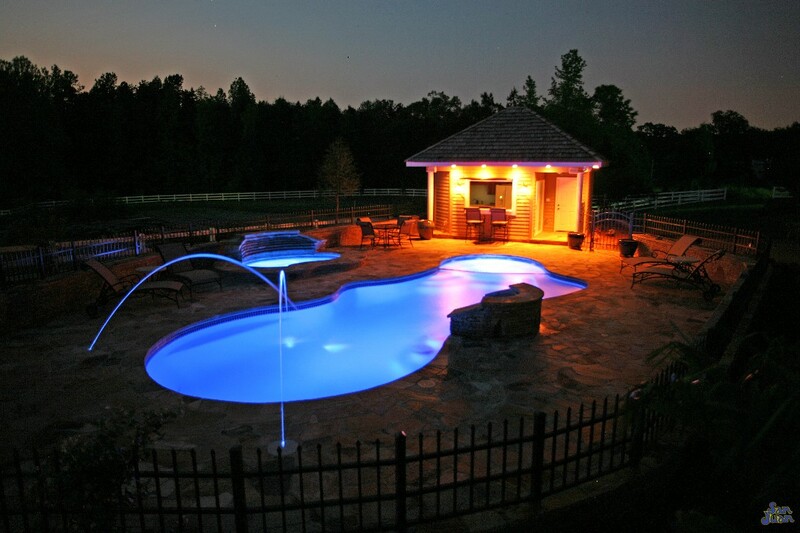 Now, as we’ve eluded to before, fiberglass swimming pools are amazing additions to homes with small to medium backyards. 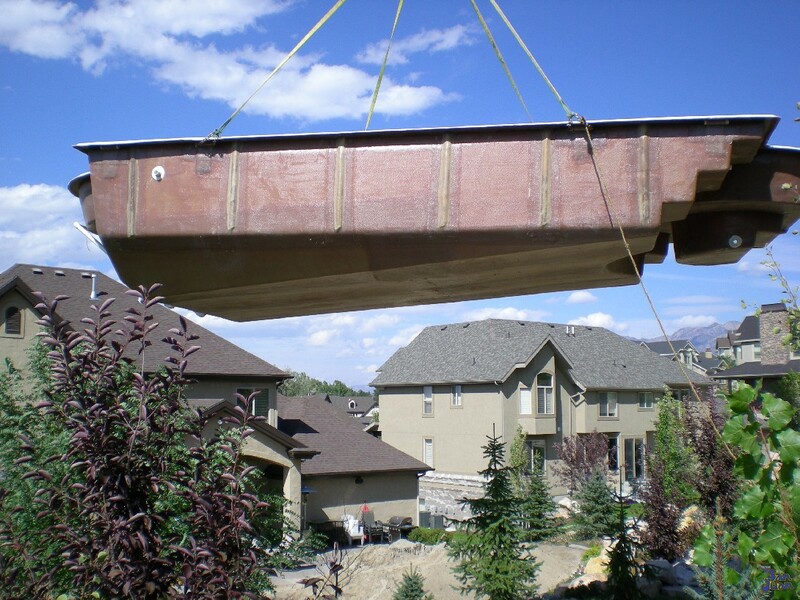 Our compact pool shapes are easily installed by using a crane to lift the pool over the home and drop it literally into your backyard! 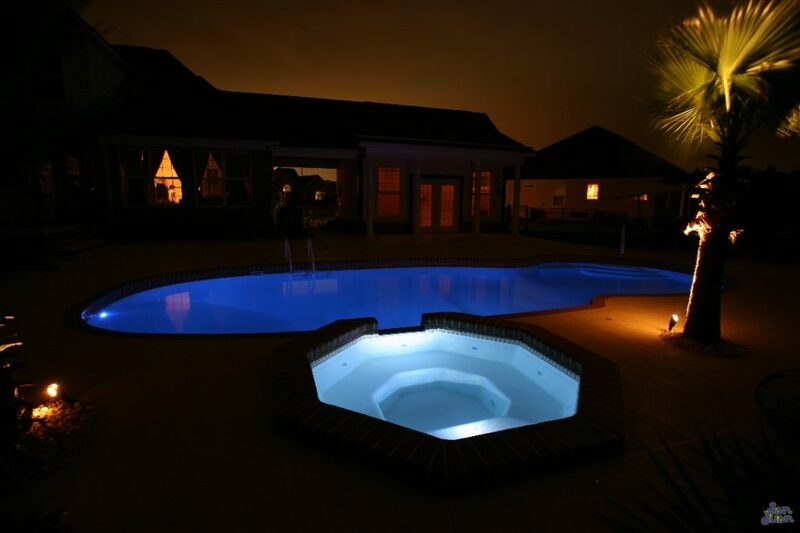 It’s an amazing process that we love bragging about, because we are the only type of pool in the world that installs pools in this unique way! 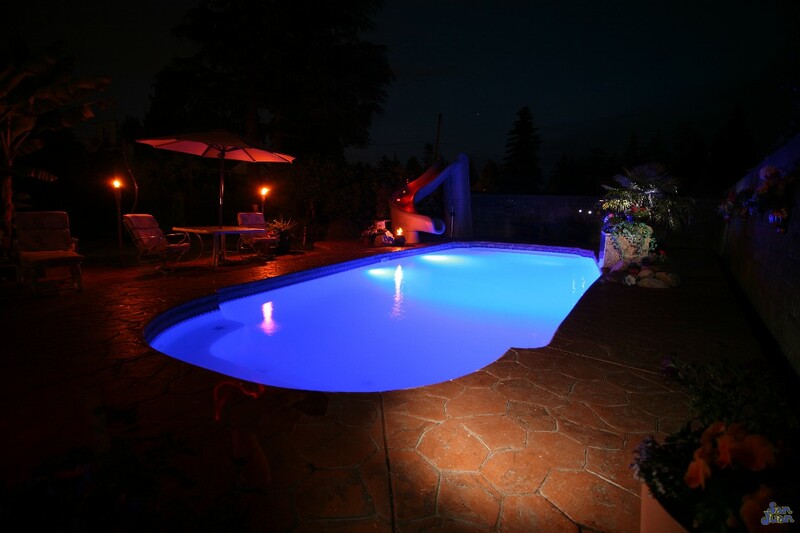 Diving in deeper, this unique installation practice allows us to enter almost any backyard premises. Of course, we still have to account for lot lines, gas lines, electrical and a few other things as well. We provide you with all of these details during our permit process and handle most of them for you. 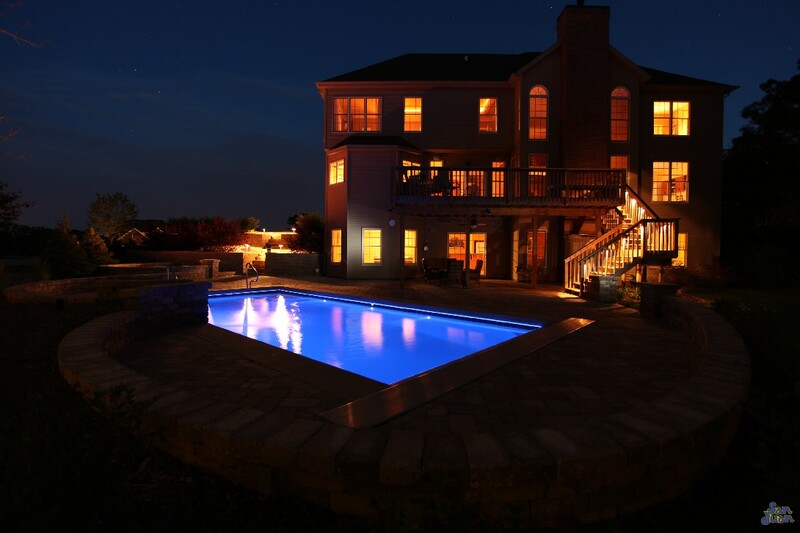 Long story short, we are a minimally invasive construction team that can build you a swimming pool with limited yard access. If we can fit a bobcat excavator through a fence line, then we can dig a pool! 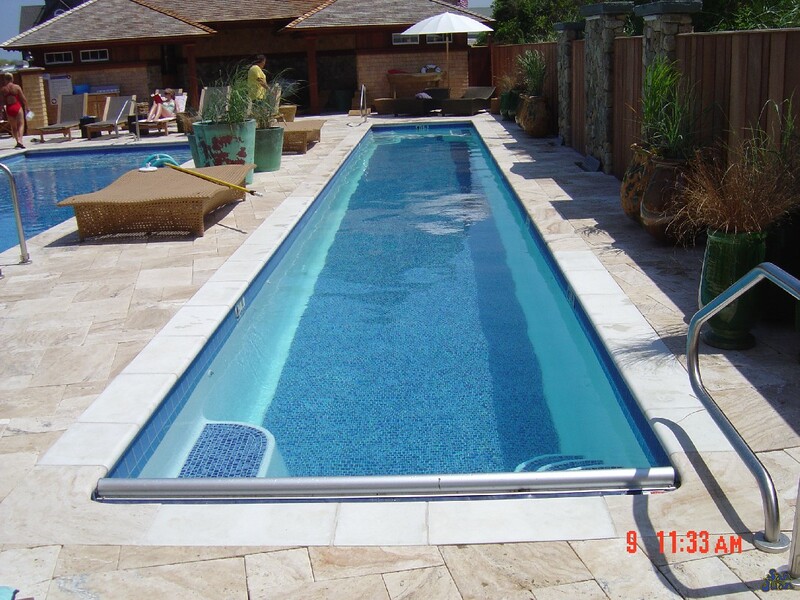 As with any new fiberglass pool installation, we need to ensure that your new pool is swim ready! 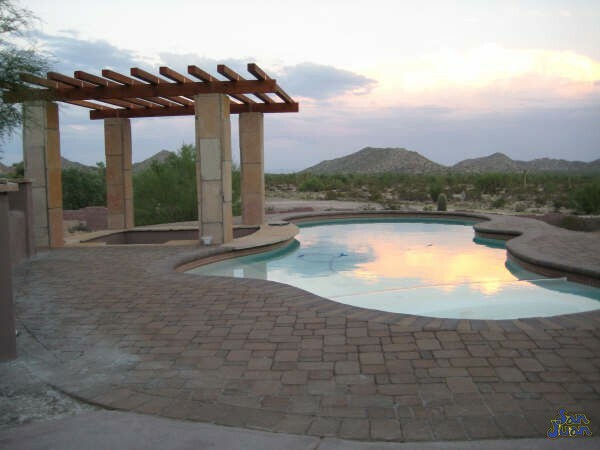 We refer to this process as the “startup procedure.” As you can see from the images of this amazing Desert Springs installation, we leave the job site with your backyard perfectly intact! 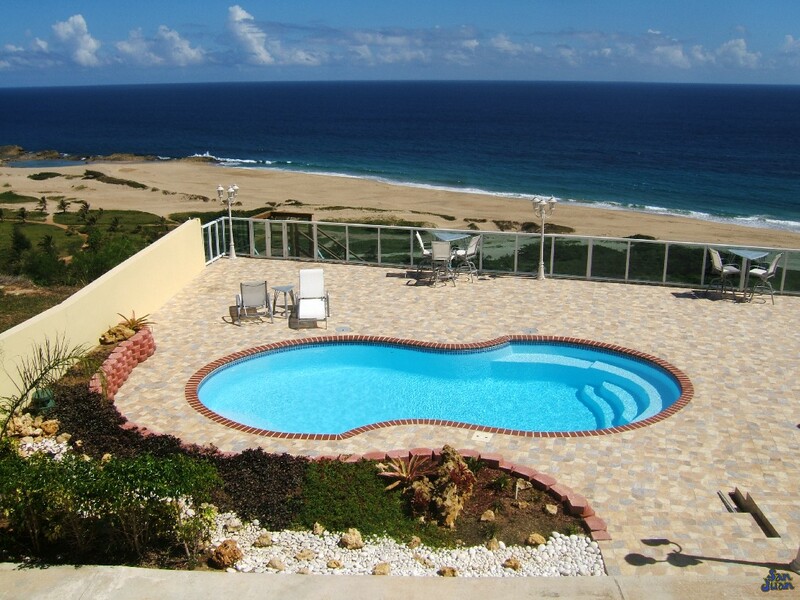 After all, aren’t you hiring us to build you a pool that you can immediately enjoy? We agree completely! That’s why we’ve got the best startup process around. 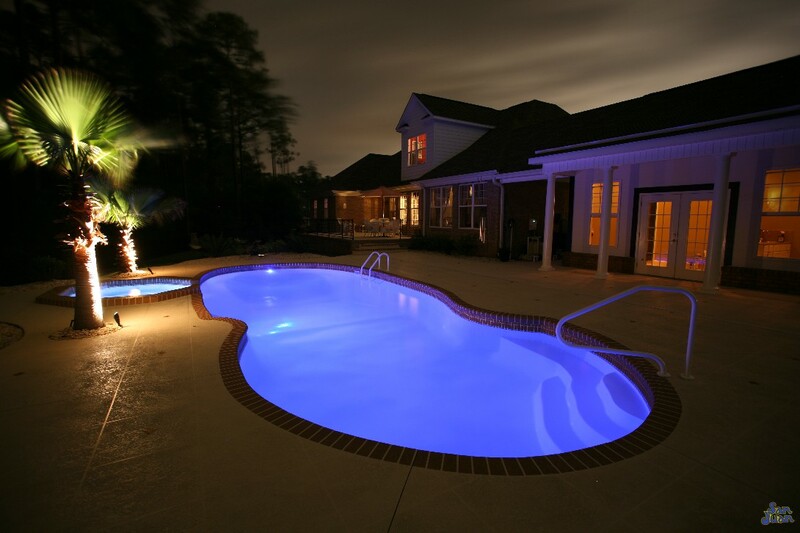 Utilizing the power of a chemical called “Revive!” we have the ability to remove the gunk and grime of construction debris from your swimming pool. Yes, you heard us right – construction work is dirty. 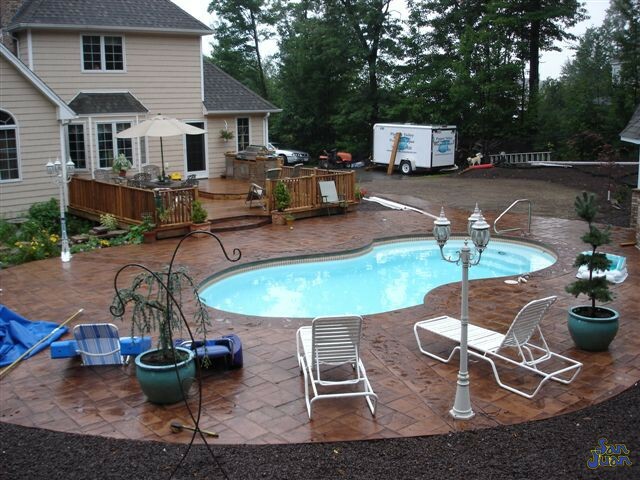 What’s really cool though is how fast we can clean up after we install that new swimming pool. Using the power of Revive! 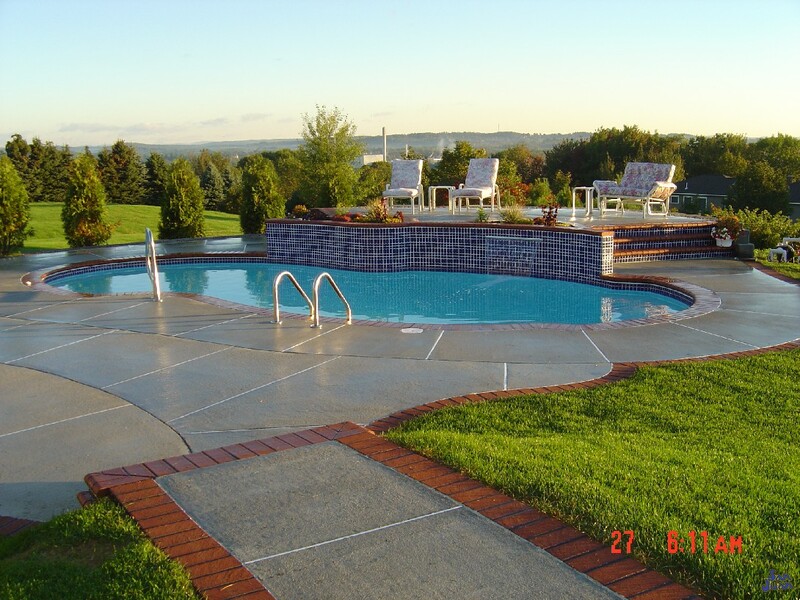 we can cause all of the dirty water to “fall out of suspension” and be easily vacuumed out. 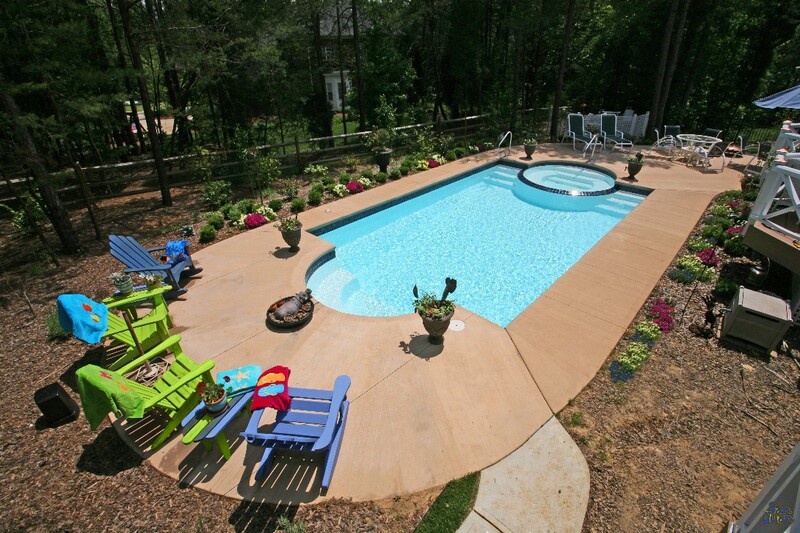 This is a simple process and is done approximately two days after your concrete deck is poured. 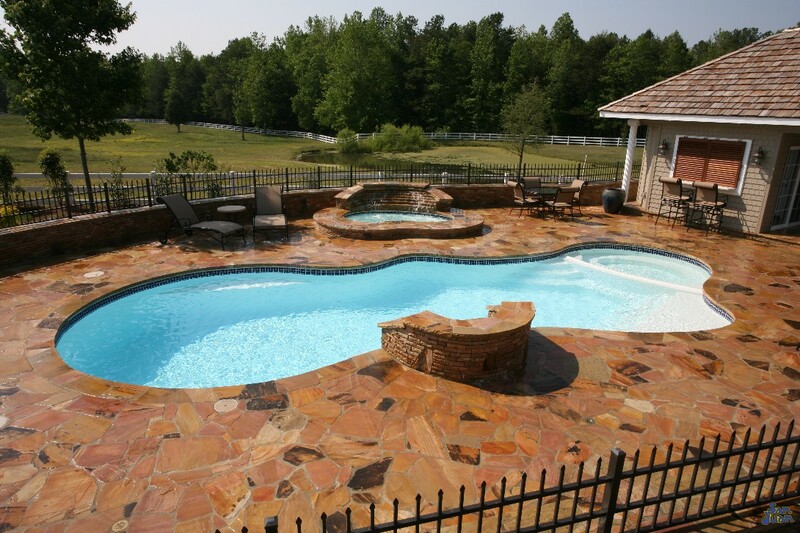 After the completion of our startup, you’re ready to swim! All in all, the new construction process should only take 14 day to complete – that’s lightning fast! 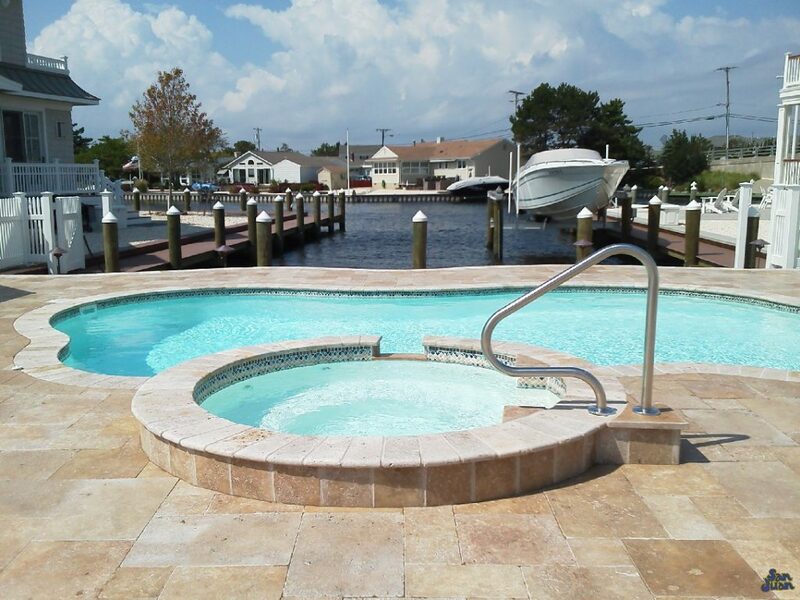 Check Out Our Other Fiberglass Articles! What are your winter specials? And do you install close to Springtown?